Kelli is one of six children. 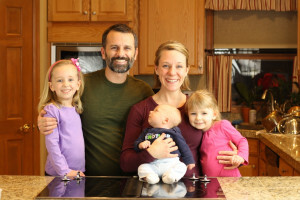 As you can imagine for her parents, getting all those mouths dressed, fed, and out the door in time for church Sunday morning was no small feat. Enter what they called the Sunday Goodie. It was a simple, self-service breakfast pastry that tided you over until the family came home from church to the Sunday roast that had been cooking all morning. The Sunday Goodie wasn’t one particular thing, but rather the name for whatever the treat happened to be. By the time I joined the family in 2003, that thing—more often than not—was a Manhattan pecan kuchen from the bakery at Wegmans, a regional supermarket. 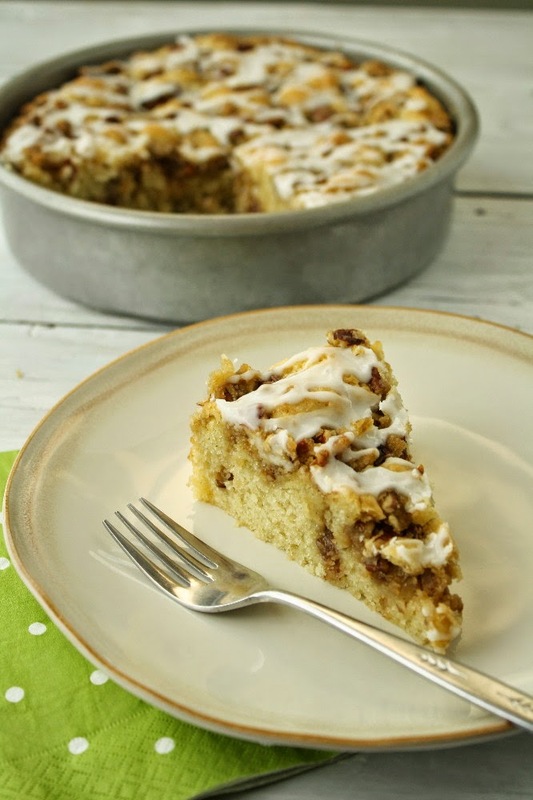 The treat was something of a cross between a pastry, bread, and cake (kuchen is the German word for cake), topped with pecans and a drizzle of icing. Our version in this recipe is less a pastry and more a moist cake, but the flavors—including a generous helping of pecans and drizzle of icing—are very reminiscent of the Manhattan pecan kuchen of yore. The Sunday Goodie lives on gluten-free. 1. Preheat the oven to 350 deg F. Grease an 8-inch round baking pan. 2. Cream together the sugar and butter/coconut oil. 3. Add the eggs and mix to combine. 4. Add the milk and vanilla and stir. 5. In a separate bowl, whisk together the flour, baking powder, xanthan gum, and salt. 6. Add the dry ingredients to the wet, and mix just until incorporated. Scrape down the sides of the bowl and mix on high for 5 seconds, until the cake batter is smooth. 7. Spread the batter in the prepared baking pan. 8. To make the streusel, mix together the sugar and flour. Work the butter/coconut oil in until pea-sized crumbles form (for butter) or the coconut oil is fully incorporated. Mix in the pecans. 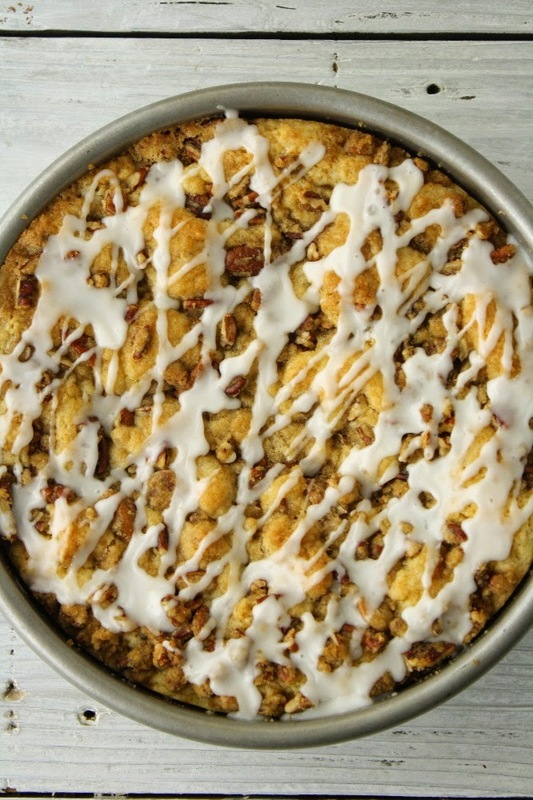 Put the streusel on top of the cake batter and gently swirl in. 9. Bake for about 30 minutes, until a wooden toothpick inserted into the center comes out clean and the cake is lightly golden on top. 10. Allow to cool in the pan for 30 minutes. 11. Prepare the glaze until it’s just drizzling consistency—start with 1 1/2 tsp of milk and add more only if necessary to make it drizzle-worthy. Drizzle over the cooled cake. Note: To toast the pecans, put them in a single layer on a baking sheet in the preheated oven before you bake the cake for five minutes, until you start to smell them. I made it on Friday night and it was DELICIOUS! Thanks so much for sharing! Just made this for a morning snack and it was delicious!! I made it with the coconut oil and almond milk and WILL make this again! Thank you very much for sharing! Lorraine and Cynthia – We are so glad you enjoyed the recipe! Does this really taste like Wegmans?? I’m going crazy since they discontinued making their MPK. One question, we are not gluten free, can I substitute reg flour? If so would I also eliminate the Xanthan gum ? Looks delicious! I have pinned this to try when the weather gets colder and I go back to baking again! Wonderful, Laurie! Enjoy the recipe. Here in Colorado our days are still warm but we can feel the nip of fall in the night and early morning air. help, I just started to make this and am confused by the flour amount. It calls for 1/2 cup (188g) but according to your site 1/2cup should only be 62.5g. Should I go according to the volume or weight for the Pecan Kuchen or have I missed something. Agh! Our apologies, Val. The recipe has a typo (now corrected). The weight (188 g) is correct. The volumetric measurement should be 1 1/2 cups (1.5 cups * 125 g per cup = 188 g). Thank you so much for your quick reply, I really appreciate it. I made your cream puff ring yesterday instead and it was delicious. 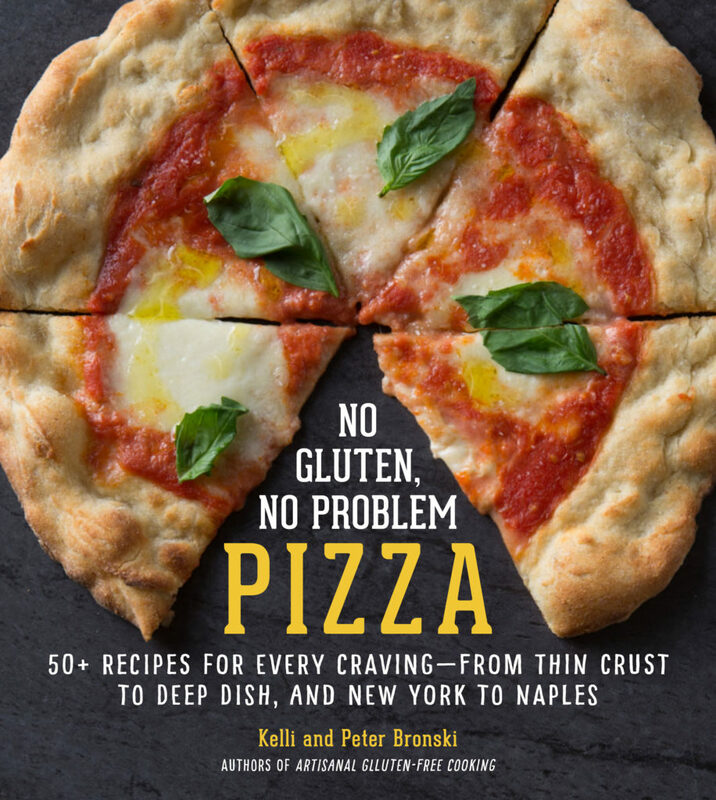 We are so grateful to have stumbled across your cookbooks and blog. You are my go to source…we love your pancakes, waffles, and crepes…even my one picky non-Celiac boy eats these GF offerings. Thanks for all you are doing for us by sharing your knowledge and skills. We love your GF pancakes so much, that I don’t even bother to look at other recipes. Pancakes are a fun meal at our house, and we are so thankful that we can still eat them. They are yummy! Everyone who has eaten them enjoy them.